Supporting their newest album "Too Weird to Live, Too Rare to Die," Panic! 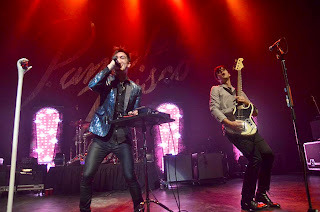 at the Disco performed in front of a sold out audience at The Vic in Chicago on September 12, 2013. The band has come a long way since their days in 2004 in Las Vegas as a Blink 182 cover band. It also seems they have their share of obstacles in becoming the band they are today, including the most recent tour departure of drummer Spencer Smith for personal issues relating to addiction. Smith is open about this issue and the band has been publicly supportive while moving forward with this latest North American tour. Prior to the show, I wanted to take a few moments to talk to a few (clearly) eager fans to try and get a sense as to the anticipation they were feeling. Two of them, all of maybe 19 years old, were completely beside themselves, "talking" about how they had been waiting forever for "Panic" to come back to the area because they are "the best band ever." There were a few other gals in line who enthusiastically concurred and in the midst of the commotion of their apparent fandamonium, I smiled and decided to continued my "research" at a local bar a couple of doors down from the venue. I ordered a quick cocktail and mentioned to the bartender that I was attending the show. Surprised, she said, "Oh my gawd, you are going to see Panic? I am SO SO SO jealous." But then she proceeded to tell me that although the band is very [very very] good and has a very [very very] strong following, it is widely known that after their first "real" tour when they had "the fun circus theme" (supporting album, "A Fever You Can't Sweat Out"), they have tended to disappoint at their live performances. This bit of information seemed odd, especially their concert that night at The Vic sold out within a matter of mere hours. In that, I was excited to see what I was in for....amazing or not. After all, I would be the judge of that....and the beholder of the pen for this specific review. Starting off the show with "Time to Dance" from album, A Fever You Can't Sweat Out", the crowd of 99.9% of young girls went completely insane. Even from that first song I could tell that the vocals and instruments were not heavily produced yet sounded surprisingly on point. Other songs included, "The Ballad of Mona Lisa;" "This is Gospel;" their newest single, "Miss Jackson"; and my personal favorite, "Nine in the Afternoon." Sure, there were minimal stage theatrics.....just a lone sign reading "Panic! at The Disco" behind the band and four small video screens scattered about the stage displaying messages of light (literally) and love to their fans. But, to be honest, I don't think they needed much more. I mean, why distract from good music? The band continues their tour in the U.S., ending in mid-October in Vegas before heading to Europe.